Huawei Enjoy 9S is to be launched in China on March 25. However, ahead of that event, the photos of the smartphone as also its specifications have already been leaked online. The online leaked photos confirm what has been earlier said about the phone. The images reflect the waterdrop-style notch as also the triple-rear camera set up on the back of the phone. 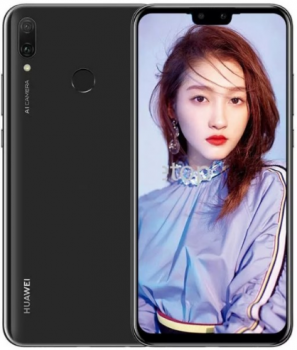 Through a number of teasers shared by Huawei separately, the company has also revealed that alongside the Enjoy 9S, they shall be launching two more devices – Huawei M5 tablet and Huawei Enjoy 9E. 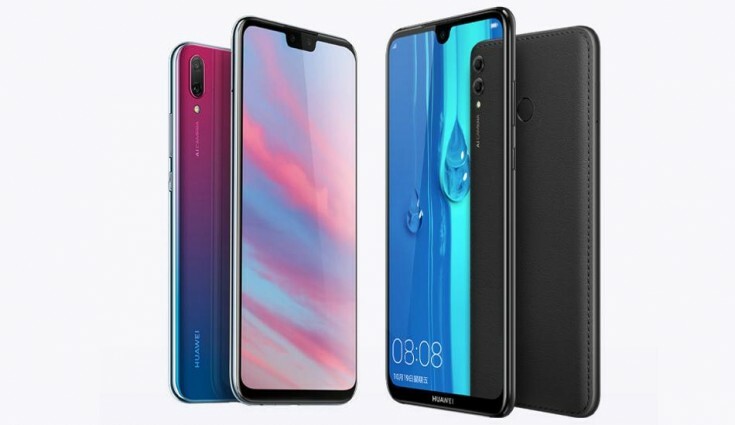 A number of MySmartPrice leaks have alleged that Huawei Enjoy 9S shall come out with four colour options – Gradient Blue, Blue, Red and Black. These leaks also show the triple rear camera set up alongwith a fingerprint sensor on the back of the phone with the LED flash. As per the leaked specifications the phone gets powered by HiSilicon Kirin 710 SoC, together with 4GB RAM and 64GB onboard storage that can be expanded upto 512 GB through a microSD card slot. Alongside, the camera set up at the rear of phone shall accommodate a 24 megapixel primary sensor, 16 megapixel secondary-sensor and a wide angle lens alongwith a 2 megapixel third sensor. Also an 8 megapixel sensor is packed on the front shooter. The phone will also feature a ,400mAh battery alongith a 6.21-inch full-HD and a display of 1080×2340 pixels. An earlier leak also suggested a 128 GB storage version of the smartphone as also the Android 9 Pie based presence of EMUI 9.0. 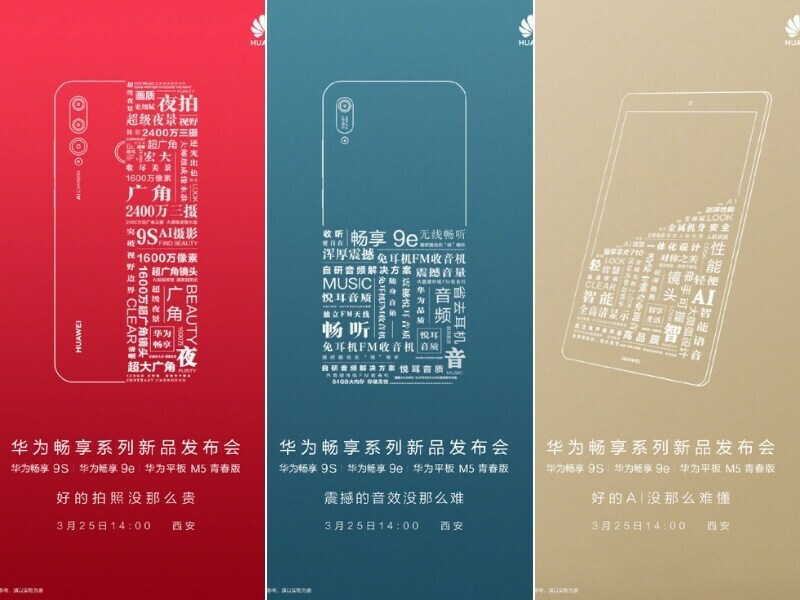 Furthermore, official teasers credit Weibo/ Huawei for Huawei M5 TabletPhoto , Huawei Enjoy 9S and Enjoy 9e. As mentioned earlier, the Company has thrice revealed in its teasers that apart from Enjoy 9S, Huawei shall be simultaneously launching two more devices Enjoy 9E and Huawei M5 tablet. Currently the specifics of these two entrants are not clear. However, the teaser suggests that Enjoy 9E phone shall be music focused with FM radio and come with 64GB onboard storage. As against that, the Huawei M5 tablet get its power from Kirin 710 SoC as also have some AI powered features. The Enjoy 9S phone teaser also confirms the camera specs leaked earlier. However, the release of these three devices outside China is still a suspense as there is no word on this. Hopefully, we may know more on this on Monday, March 25, at the time of the China launch.